Yartzevo Defiant is a campaign module that I have been working on to support the Tigers at Minsk rules and it may interest owners of other rulesets. It covers a small part of the Soviet counter-offensive that followed the Kursk battles on the eastern front in 1943. The module is going through a final play test and the campaign is nearing the end. Both sides have exhausted their reinforcement pool and the Soviets are preparing to attack into the town of Suetovo - a critical location at this stage of the campaign. This post will give a brief overview of the campaign and will then cover the action at Suetovo - all of which is intended to set the scene for the release of the campaign module (free download), which should follow shortly. Please press on the 'read more' tab for the rest of this post. Tigers at Minsk covers tactical WWII actions using an 8 x 6 hex grid and with 4" hexes, it can sit within a large pinboard sized playing area. 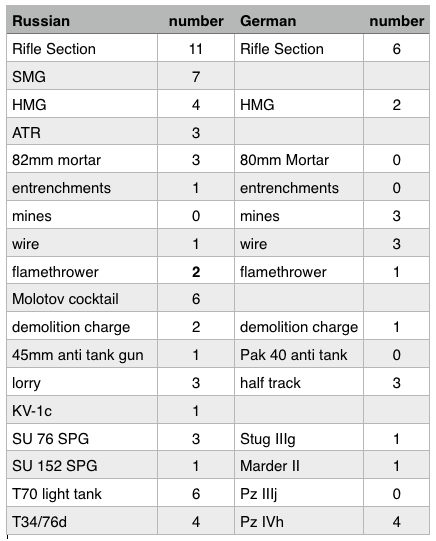 At the moment the rules have unit stats for the mid-war on the eastern front. The rules are available as a free download (see the resource section at the foot of this post). Basically there is a campaign track, showing several types of themed battle boards such as city, wooded, open and river etc. At one end of the track is the city of Yartzevo (German held) and at the other end is a wooded zone (Soviet held). At the start of the campaign, the Soviets launch their offensive from the wooded zone, aiming to drive down the campaign track (all German held), attacking each board in turn and finally assaulting and capturing Yartzevo at the other end. For their part, the Germans aim to stop the Soviets and then to drive them back, ending the offensive by capturing the wooded zone from where the offensive was first launched. These objectives are the major victory conditions for the respective sides, ending the campaign at the moment of capture. There is a town called Suetovo that is in the middle of this track. Should the forces become too exhausted to fight any further, without having reached their major objective, the campaign stops and whoever controls Suetovo can claim a minor victory. The latest playtest has brought the campaign to this point. The importance of the next battle is that both sides are now unlikely to win a major victory. The Germans in particular are close to exhaustion and the Soviets are about to attack Suetovo. The Germans have to hold it, as they would unlikely be strong enough to re-take it. Conduct of the campaign so far. 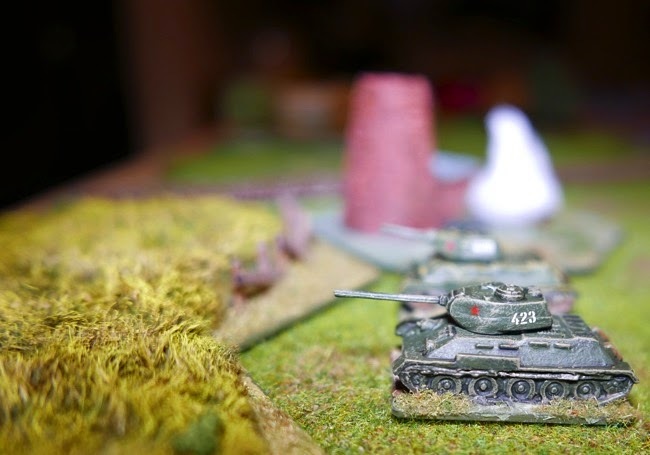 The Soviets attacked out from their wooded jump off position into an open board. At the start of every game, a new board is generated using a terrain generator, even if that board has previously been fought over. 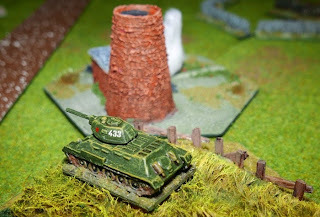 Note - The winner of a battle always becomes the attacker in the next game - even though this might not suit the player's own wishes, reflecting the real campaign in which the Germans counter-attacked aggressively and the Soviets were driven by their goal to keep on attacking. It is this two sided nature of the campaign that makes it an interesting situation for both forces. The Soviets would typically break through the open terrain but then get repelled at the River Vostoshka, allowing the Germans to counter-attack back towards the wood. At one stage the Germans were set to attack the wood itself and I thought that a German victory was a foregone conclusion and that the campaign would end .... but no, the Germans were again pushed back to the river. This cycle of attack and counter-attack was repeated several times. Whilst this successfully held the Soviets back from making any deep advance, it also substantially drained German strength. Eventually, the Soviets found a weak point at the river (the terrain generator was a little cruel to the German player on that occasion) and they pushed across and then took the hilly ground beyond. They are now preparing to assault the town. Both sides have just received the last of their reinforcements. From this point on, the sides will become increasingly exhausted as the fight continues. 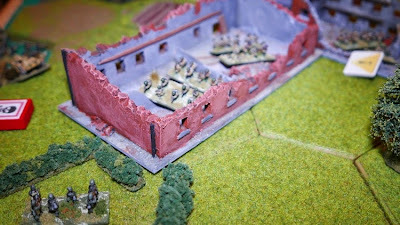 A rule that will now help the German player is that once the reinforcement pool is empty, a player is not forced to counter-attack if they win a battle. So if they can hold on to Suetovo, they will now not be forced to attack, rather the Soviets will be compelled to attack them again as Suetovo holds the key to getting that minor victory. At this point in time each side has the following Order of Battle - though in a battle, a defender can only draw 10 units and an attacker can only draw 16 units to fight with. Engineering assets such as mines, demolition charges etc do not contribute to this number, neither do trucks or half tracks used for towing. 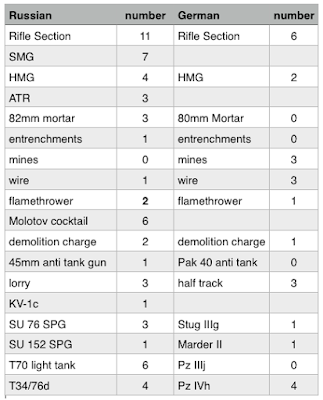 You can see from this roster that the Soviets have roughly a 3:1 superiority, both in infantry and vehicles, justifiably giving them some confidence in their capability to sustain action for more than just the next engagement. The Germans will be able to add one rifle section to their strengths, as a previously routed unit will return for this game - but this is really scratching around and reflects that their infantry losses throughout the campaign have been heavy, leaving them painfully short of infantry now. The terrain generator gave the below gaming board. The defender always has row F as their baseline and the attackers always start off board and will enter along row A. The terrain generator has given us part of a town that has a couple of large buildings, maybe apartment blocks or factories. 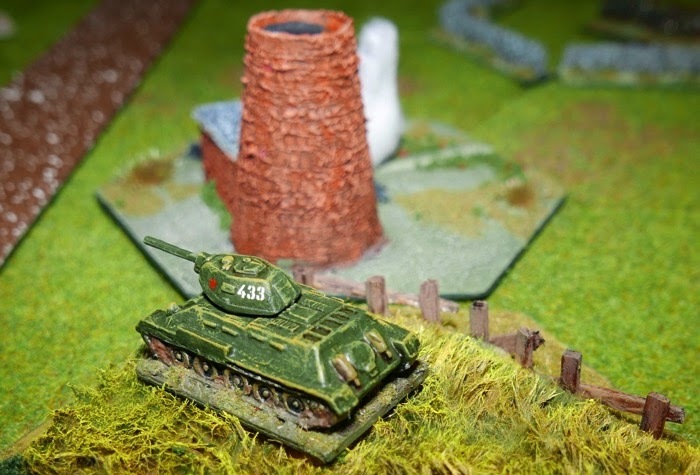 The Soviet far left flank gives some opportunities for armour to deploy without facing obstacles or ambush. Everything on the map except the fields block line of sight (there is a total absence of any high ground). 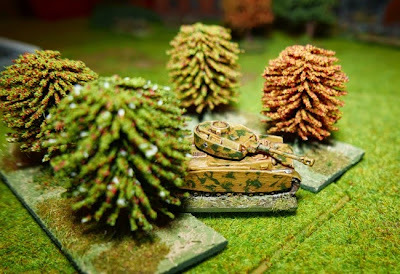 Tanks have to test before they can enter woods, while buildings halt their movement for one turn (though vehicles can start the game set-up in woods). 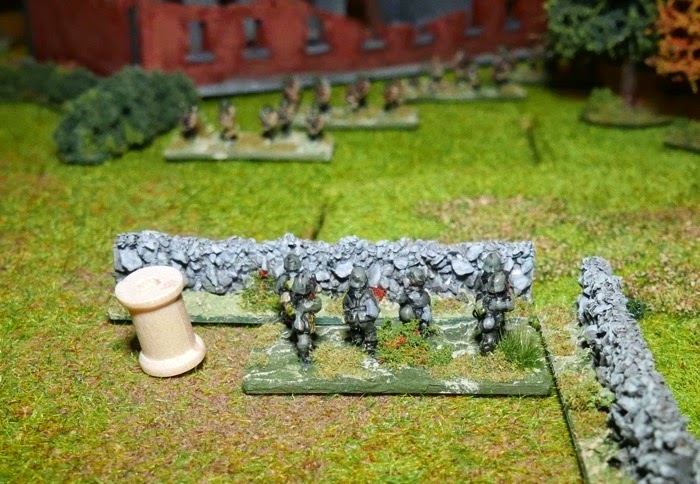 The campaign terrain rules concerning walls and hedges have just been tweaked. Each allocation now covers three continuous hex sides with the feature, so that they offer protection from a selected direction, but once captured, the other side don't generally benefit from their cover, as they are 'in hex' features (not hex-side features as in some tactics games) fire will likely come in from their open sides. Since all cover provides the same sort of protection, treating linear obstacles like this just adds an extra dynamic to how the terrain interacts and helps differentiate the feature from say how a building or a woods offers protection. German Order of Battle: They have chosen 5 x rifle sections, 2 x HMG, 2 x Pz IV and 1 x StuG III. They also get 2 artillery missions and 2 observers. From their engineering assets they have chosen 2 mines and three wire. They have supplemented their strengths with 1 flamethrower and 1 demolition charge. Russian Order of Battle: They have chosen 5 x rifle sections, 3 x SMG sections, 2 x HMG, 3 x T34/76d, 1 x KVc, 1 x SU 152, 1 x 82mm mortar (with observer). They also get 3 artillery missions and 2 observers. From their engineering assets they have chosen 4 Molotov Cocktails and 2 flamethrowers (these will act as attack modifiers in close combat). The below map shows the use of German engineer assets in red. MINES are in C1 and C5. WIRE is in C4, C7 and C8. The three symbols in F2, F4 and E7 are German armoured vehicles with 75/48 guns. The defender is always allowed to set-up within rows C to F and in this instance, since they need to degrade enemy forces and hold the Soviets at bay for as long as possible (the attackers only get 1 hour and 15 minutes to win a battle, otherwise the defenders win, so the attackers cannot just sit back and overwhelm with firepower, they must press on as well), the Germans decide to occupy part of building C2, giving them a forward fire base and using the hedge as a fall-back position. The Soviets will send in SMG and rifle sections at A2/A3 to work through the buildings. Infantry sections and a mortar will come on behind B5/B6 and all of the Soviet armour will strike down their left flank, entering at A7/A8 and looking for a speedy exit along the enemy baseline. Turn 1. Time 0800 hours. German morale 5. Russian morale 7. The Soviets are Player 1. They put their pre-attack smoke marker in hex A2, to help cover the SMG assault on the buildings. Rifle sections and an HMG are able to quickly get into the large building at B5/B6 as their approach was concealed. On their right, Soviet SMG and rifle sections advance under the cover of pre-laid smoke. Turn 2. Time 0809 hours. German morale 5. Russian morale 7. Soviet SMG enter the large building and one takes a pin from a reacting German HMG (in the nearby woods). 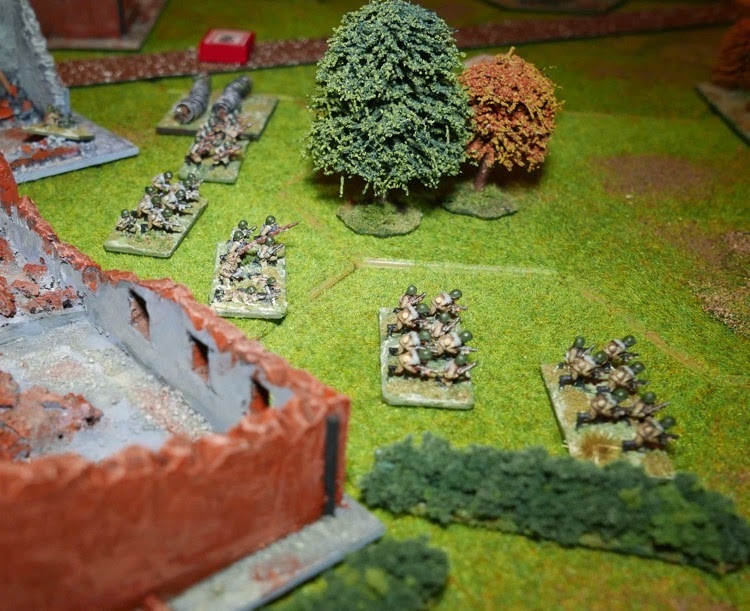 The adjacent German rifle squad decides to take the initiative and assault the Soviets while one of them is pinned. They take a flamethrower and demolition charge into the firefight. Both sides face off in the same building. The soviets also deploy a flamethrower and demo charge, so there are dice flying around everywhere. It was expected that both sides would melt away under that kind of firepower, but it was the Germans who took the brunt of casualties, as they assaulted into a hail of bullets. It was a death and glory attack, reckless but brave - but to no avail. The German section was removed from play and both SMG units were simply left pinned. German morale reduces by 1 to reflect the loss. Turn 3. Time 0819 hours. German morale 4. Russian morale 7. The Soviet armour on the left had been somewhat obscured from view due to the wall, but in any case, the German vehicles have been rather tardy in their response, having spent a couple of turns out of command. The Soviet SU 152 (Beast Killer!) made short work of the StuG that had taken cover at the local power house. (see smoking the vehicle in the background). In response the two panzer IV's turn to engage the enemy tanks, waiting for them to come into sight. fires at the central large building. Turn 4. Time 8028 hours. German morale 3. Russian morale 6. A T34/76d and KV-1c halt to take up positions and fire on the Panzer IV's. 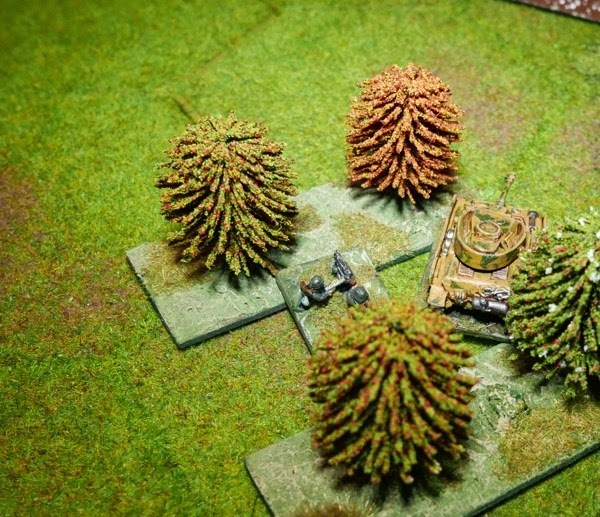 They get a lucky shot as they turn to face the Panzer IV that has moved out into the open. The sole remaining German vehicle - the Panzer IV in the Orchard, takes out a T-34 in reply. 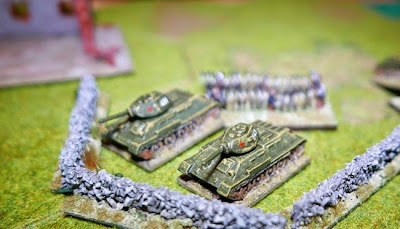 Soviet tanks break off their advance to engage the Pz IV's. The German player is feeling like the game is slipping away. Turn 5. Time 0840 hours. German morale 1. Russian morale 5. German morale is dangerously low and the HMG in the woods has been attracting a lot of enemy fire. Unsurprisingly it succumbs and German morale drops to zero, causing immediate retreat checks on every unit. Three fail and two leave the board. The Pz IV is fortunate to stay in position (it had a 50/50 chance of retreating off board) and manages to knock out the SU 152. Turn 6. Time 0851 hours. German morale 0. Russian morale 4. While the situation looks dire for the Germans - and it really does, it is also true that the Russians are under pressure. The game clock has been advancing quite quickly and they need to get 2 units off the board before 0915 hours or force all the German units to leave the game either by casualty or retreat if they are to win. The KV-1c engages the Panzer IV whilst two T-34's push on towards the fields. to exit the board. The orchard is just beyond the power house to the left. The T-34's cannot afford to just enter the field and exit as the Panzer IV in the orchard would have a bead on their flank, but stopping to engage the enemy will break the momentum of the assault. Turn 7. Time 0857 hours. German morale 0. Russian morale 3. The time is now really starting to matter. The dice rolls for the game clock have been high. A random event gave the Soviets 'tank fright' so any unit already in cover could not leave cover for that turn. This added more delay to the SMG units that should have been pressing down the right wing, they have also repeatedly been either out of command or pinned since the close assault in turn 2. The T-34's enter the cornfield and swing right to face the Panzer IV at the orchard - but the German tank is ready for them and it knocks out the first T-34. The situation has gone critical for the Soviets as now they do not have enough units near enough to the enemy baseline to give them a win for exiting by 0915 hours. Now alone - all his chums have been knocked out. Turn 8. Time 0909 hours. German morale 0. Russian morale 2. Rather too late in the game, the Russian assault infantry finally get going. The SMG units only have a weapon range of 1 hex, so they must close with the enemy to be effective, but once they do, they can be devastating. The Soviet right wing starts to advance. The lone T-34 fires and misses, but the return fire knocks out this last remaining Soviet tank. Exiting their army before 0915 hours is no longer viable. The only way for the Soviet player to win now would be to clear the board of German units before 0915 hours, but the game clock is just 6 minutes away from that fateful deadline. A Panzer Ace in the making! Turn 9. Time 0912. German morale 0. Soviet morale 1. Assume nothing in this game ...... the clock advances by just 3 minutes, giving the Soviets another opportunity. 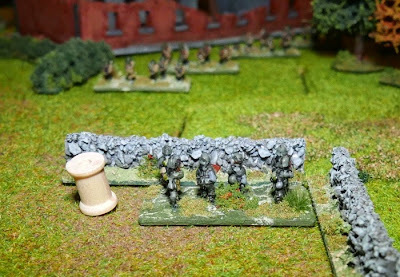 There is no way they will move to the board edge in time, but they have one rifle section that could fire on the last remaining German infantry unit, which is pinned on the German baseline, behind the wall in hex F2. 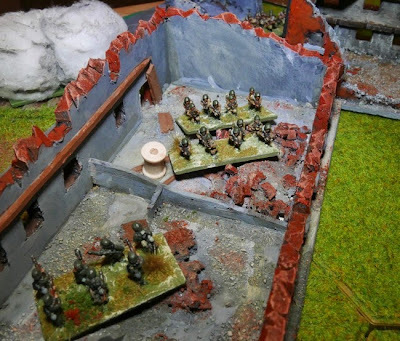 They get two dice, if they score at least one 6, the German rifle section would be removed from play and the remaining tank would have then have to take a retreat check (as force morale is below zero), which could sweep it from the board. The odds are not in the attackers favour, but we are down to last die rolls here and the Germans are holding on by their fingertips only. The Soviets need to try and just make this last effort work...... the infantry section fires and fails. Turn 10. Time 0914. German morale 0. Soviet morale 1. I smile, the clock advances by just 2 minutes, surely it is teasing me. The Soviets get another chance to fire with the rifle section, this is a tense ending for both sides, everything could rest on this - but again the Soviet rifle section fails to dislodge the German infantry from their walled position. End of turn 10 and the clock is advanced to 0920 hours and so the game is called. Who would have believed at the start of this game, or even at half time, that the Germans had any real prospect of holding this board - it had really looked like it was over for them. In the first part of the game, the Germans could have been expected to inflict heavy casualties on the Soviet SMG units in their sacrificial close combat attack at the large building, but it went so badly wrong. Likewise, the German armour could have been expected to remove a couple of Soviet tanks earlier on. This would have brought the Soviet morale low enough (to 4) that further attrition in the game over the remaining hour would have made things much less certain for the attackers - but it was the actions of the Panzer IV in the orchard that kept the Germans in the game, together with the Soviet right wing (infantry) being tardy in their advance. Perhaps the Panzer IV should get a +1 in the next game for being an Ace! Anyway, a very tight and enjoyable game, with the surprise that the Germans still hold Suetovo. This means that the Soviets will now have to attack it again. 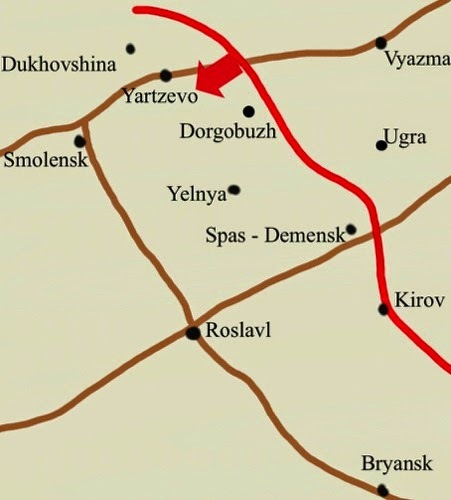 The Germans will be weaker, but if they do lose Suetovo, at least the Soviets, who have lost all their heavier armour, might now have been weakened enough that they will not be able to carry on the drive towards Yartzevo itself. After the the surprise German success in the last game, the Soviets made their second attack into Suetovo. The germans had to deploy everything to get their allowance of 10 units in defence, while the Soviets could still plan what sort of force they wanted to use for this attack. The Soviets were fortunate to get enough cover to conceal their opening moves. There is a link to a short video below that shows the battlefield and how the units were set-up. The Soviets made excellent use of crossfires and team work to get their advance moving and to break the defence. At the end of the game the Germans had lost 4 rifle sections, a Marder and a Pz IV. This leaves them with a small order of battle that only includes one infantry unit. I decide that this represents total collapse of the German front and that the Soviets will be able to push all the way to Yartzevo without any prospect of being held up and as such, I am calling the campaign now and giving the Soviets a major victory. Short video of the set-up for the second battle - view embedded immediately below or below that is a direct YouTube link. LINK - Tigers at Minsk rules (free download). It read as tense as it likely was playing it. I really enjoyed reading the report. I too thought it was all over for the Germans. The last two clock dice rolls were amazing, but still not enough for the Soviets. Looking forward to the campaign when it comes out. Thanks Shaun - yes, it really was a roller-coaster. I knew I had to see it through to the end for the sake of the playtest, but I never imagined that it would give so much fun. I have just drawn up the next randomised map, ready for the second battle. Interestingly, the Germans are quite weak, but they do have those 3 x Pz IV's available (plus a Marder) and that should give the Soviets some cause for concern. German numbers are so low now, that the vehicles will have to be included in their defensive force if they are to meet their requirement of having 10 bases in defence. Looks good. What terrain generator are you using? Maybe I could give this a try for the drive on Moscow. Hi Eric. My terrain generator can easily be adapted for any game. There is a table that runs off a D6. there are several columns on the table, each representing a definitive game board, such as the river board or hilly board etc. You just roll on the table and take the selections. The type of board will determine whether there is any mandatory terrain (i.e. a river board must obviously start with a river) and the number of dice that will be used to generate that board to help define terrain density. There are rules of placement, so that distribution does not benefit one side over the other - except the defender gets a minor advantage in taking the first selection - once you understand the subtitles of placement, that seems to give just the right amount of advantage. It has taken some thirty odd games to get it tweaked to what I wanted it to do, but now that it balanced, a player could easily swap out some items to better represent the campaign area that they are dealing with (i.e. more or less marsh etc). I will probably have the documents ready by Sunday for uploading and will open a new blog post to support that, giving the link to the free campaign module in PDF format. Your terrain generation system sounds interesting. I'll look for your upcoming campaign PDF post.